At Summer Heights, you can jumpstart your day with coffee in bed while you watch the sailboats and yachts head out into open water. 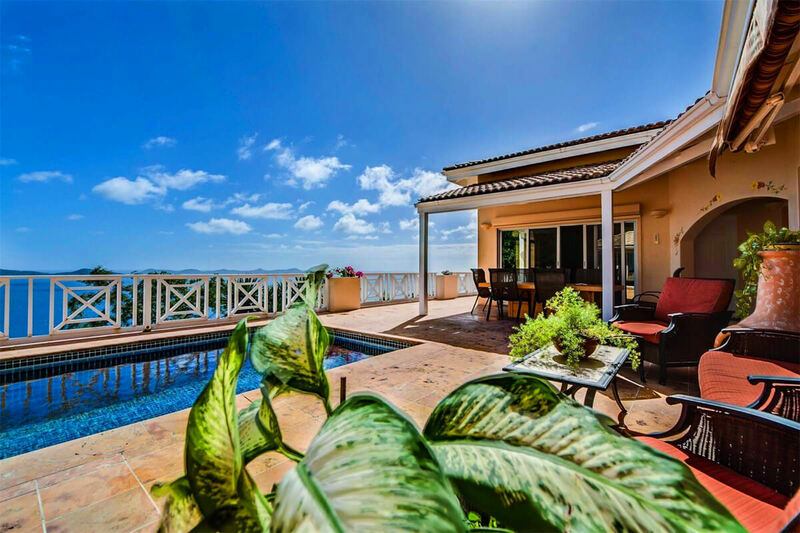 From the villa, you have easy access to a wide selection of restaurants and shopping just minutes away in Nanny Cay. In the evenings, you can relax by the pool and watch the sun disappear over the horizon, then see how many constellations you can identify in the clear island skies. Summer Heights sits hillside above Tortola’s beautiful Nanny Cay. With ocean views and constant trade winds, this vacation rental is perfect for couples or families. A broad Mexican coral staircase leads to the river stone courtyard, where the blue-tiled pool overlooks the sea. A dining veranda provides the perfect setting for casual dining and sunset-viewing. Enjoy an early morning sunrise or watch yachts tacking up the Sir Francis Drake Channel. Sliding doors lead into the lounge, which has a white leather sectional and armchairs, a media library, and a 40” flatscreen TV. The villa has a computer, WiFi, and board games as well. A curved glass brick wall separates the lounge from the kitchen, which has standard appliances, an espresso machine, a bread maker, a cookbook collection, and expansive countertops. Exposed cathedral ceilings and tile floors run throughout the common area. The housekeeper comes twice a week. All four king suites have air-conditioning and ensuite bathrooms. The lower suites open onto a semi-shaded deck hung with a double hammock, and the upper two bedrooms open to private balconies. Each suite has its own telephone, VCR, radio, coffeemaker, and ocean views. The Turtle Dove Suite is at the opposite end of the pool and opens to the deck through sliding glass doors. It has a king bed, A/C, a bath with his and her sinks, a bidet, and a large shower. The lower level of Turtle Dove has a children’s suite equipped with two twin beds, and ocean views. Summer Heights is a relaxed and restful haven for couples or families. This villa is conveniently located close to town, shops, restaurants, and West End beaches. The owner has accommodations on the lower side of the property, completely separate from the villa’s amenities. Welcome - please note all the bedrooms at Summer Heights are separate and accessed from the outside. Two additional children can sleep on air mattresses in the great room or the loft bedroom of the Turtle Dove suite.